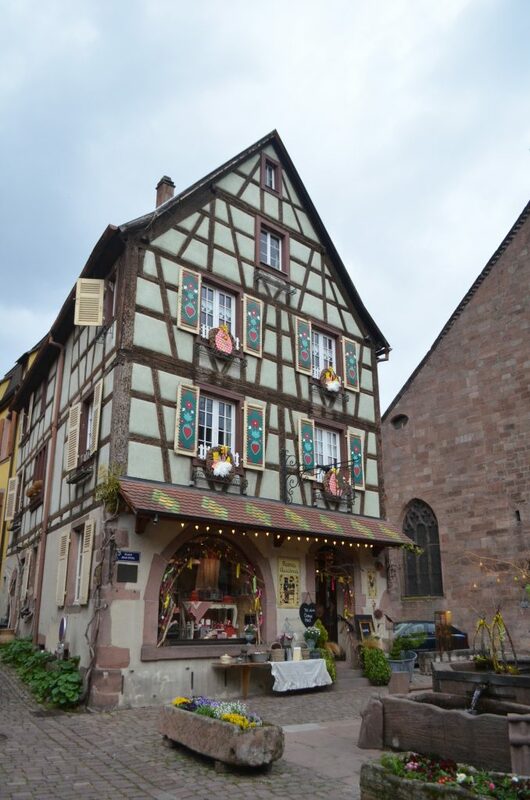 Imagine the fairy-tale beauty of Strasbourg concentrated into a small village with just a few roads, a gorgeous castle and some surrounding vineyards. Such a magical place exists and it’s called Kaysersberg! 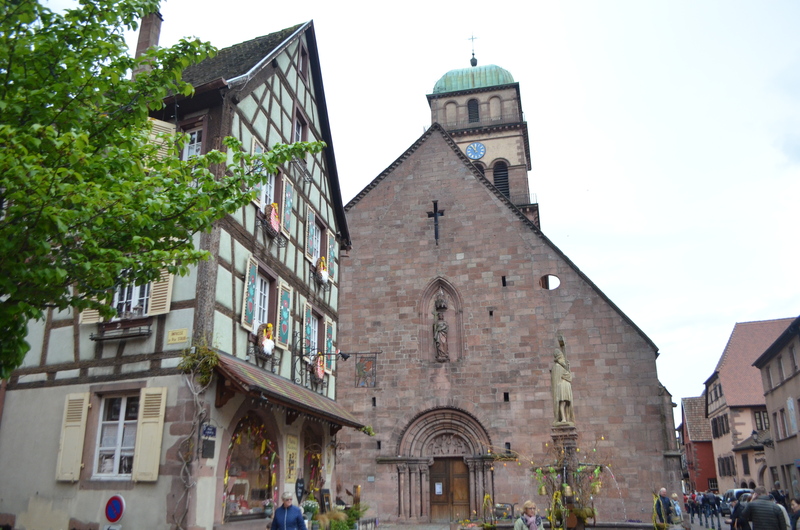 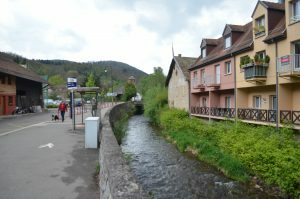 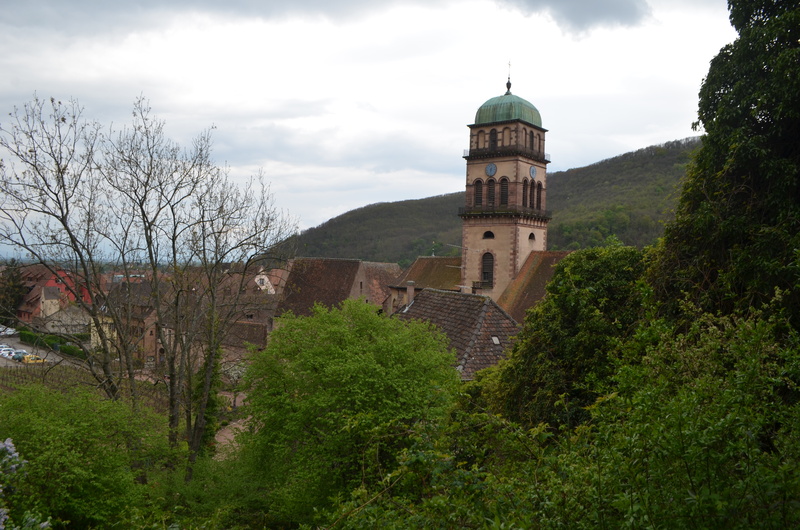 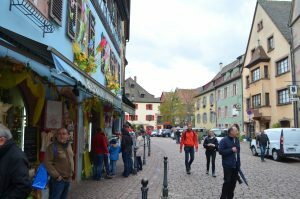 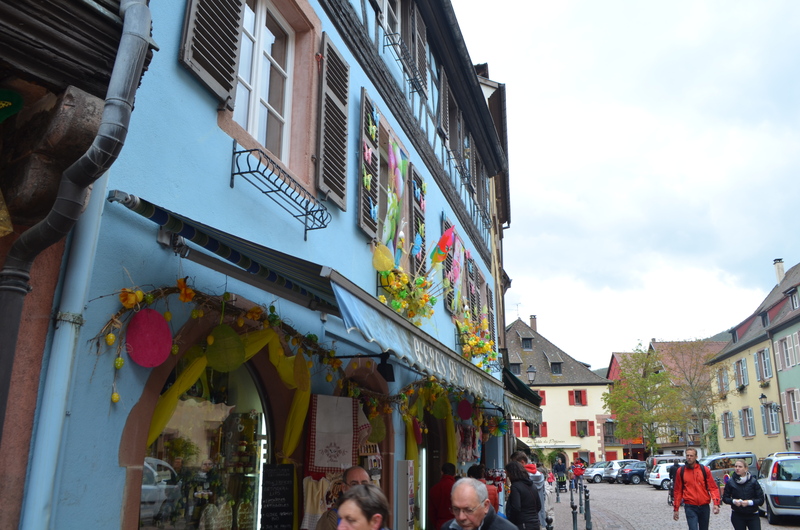 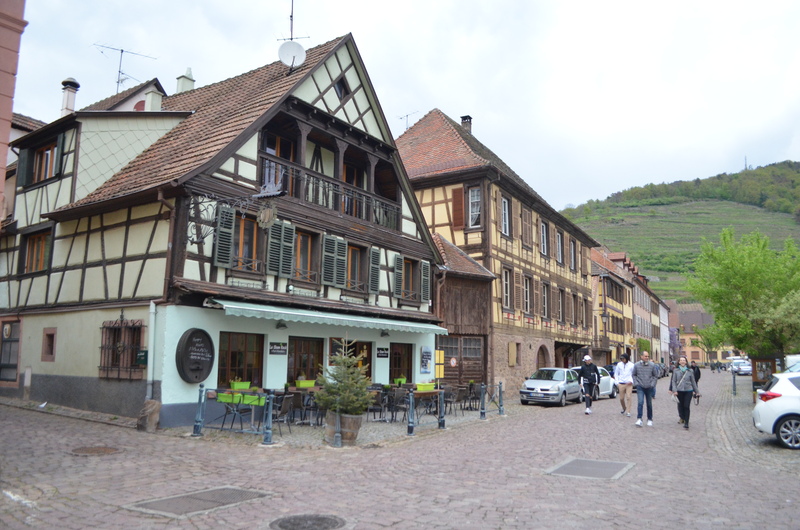 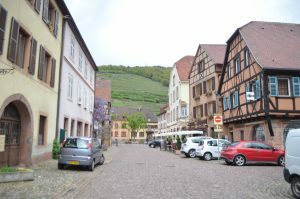 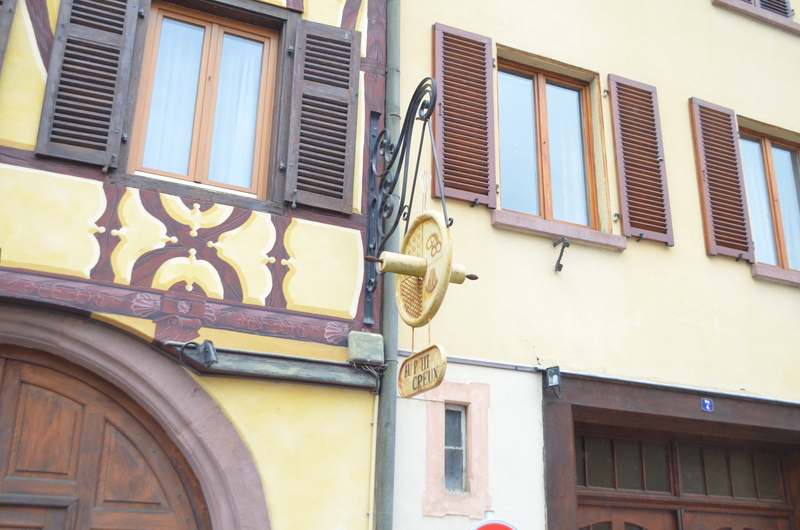 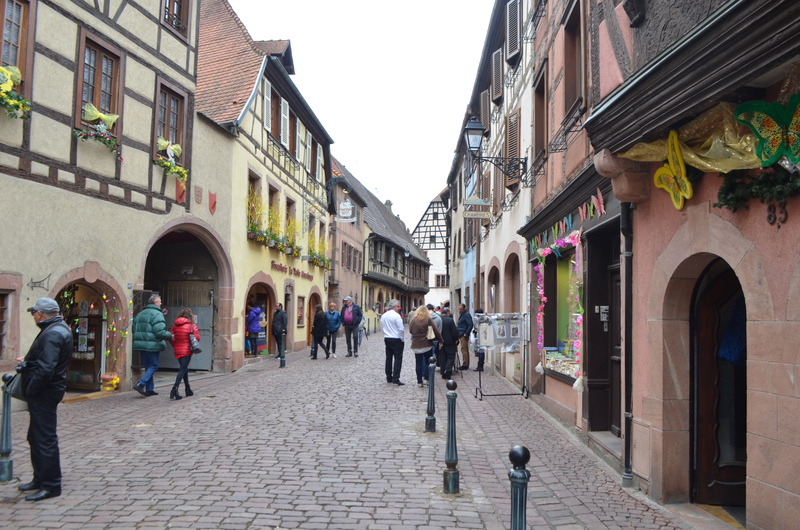 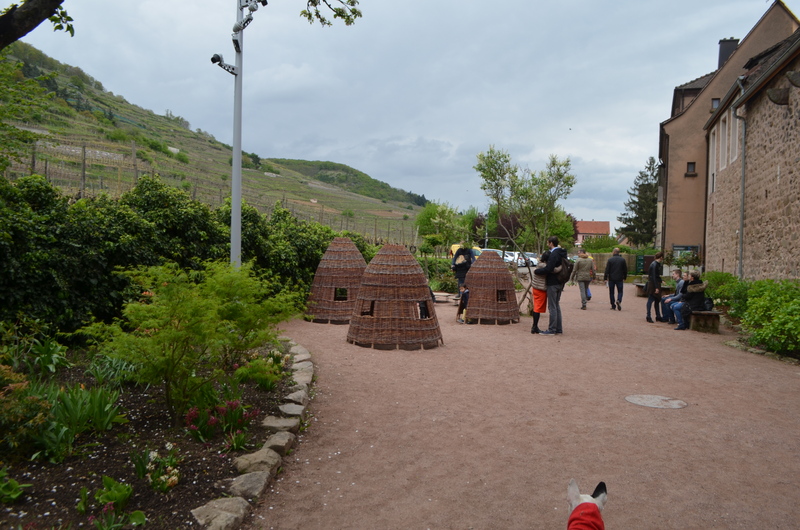 We stumbled upon the medieval village on our search for castles in the Alsace region and I’m sure glad we found it! 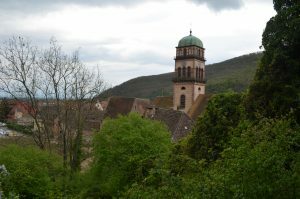 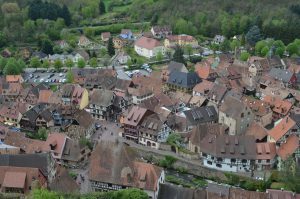 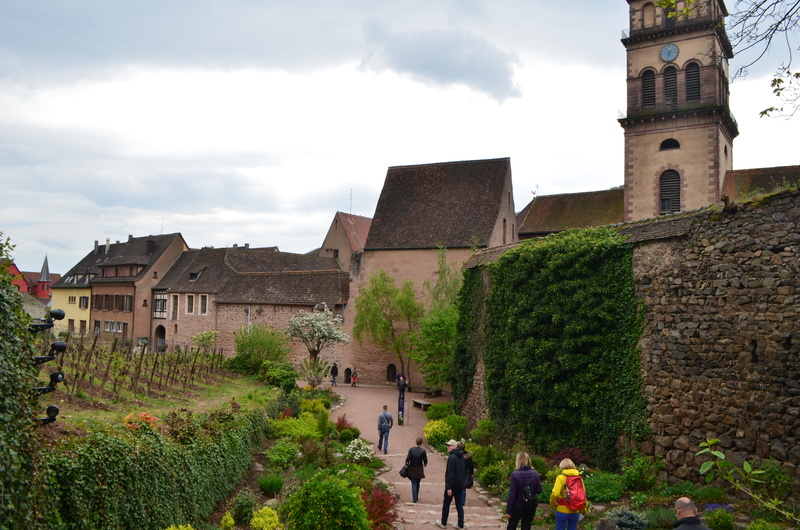 Located just an hour south of Strasbourg by car, Kaysersberg is worth a visit if you’re ever in the region. 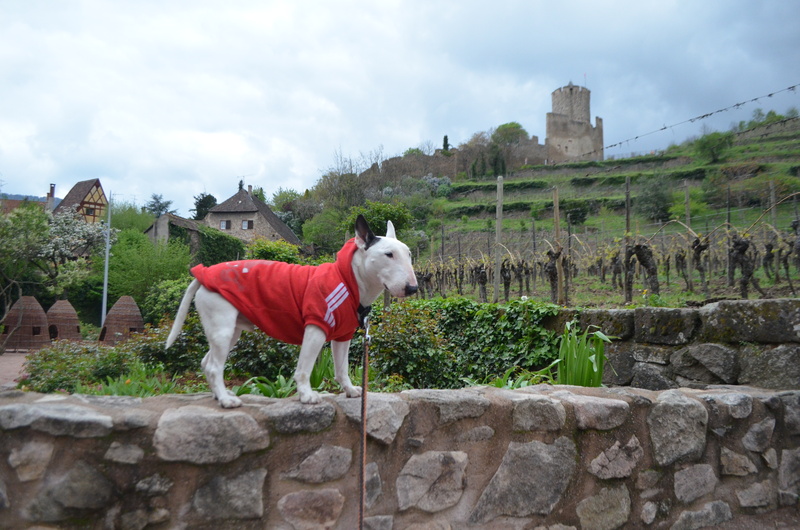 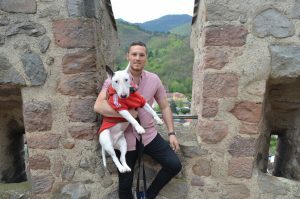 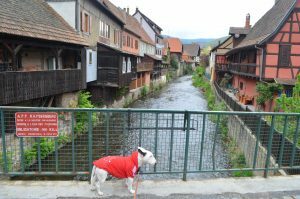 As a bonus, it’s a super dog friendly village as I was able to join my human friends on their adventures hiking up to the castle, eating waffles and of course drinking the finest French beer and wine! 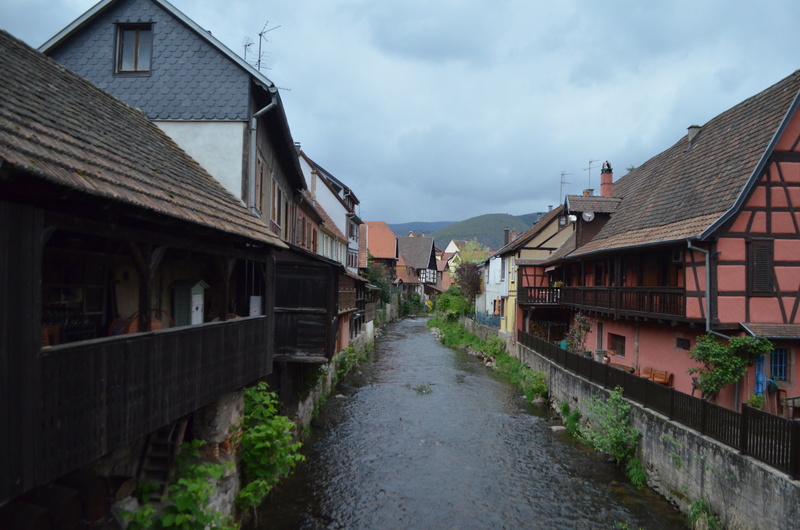 Take a look at these wonderful traditional houses and the gorgeous canal. Now imagine living here! 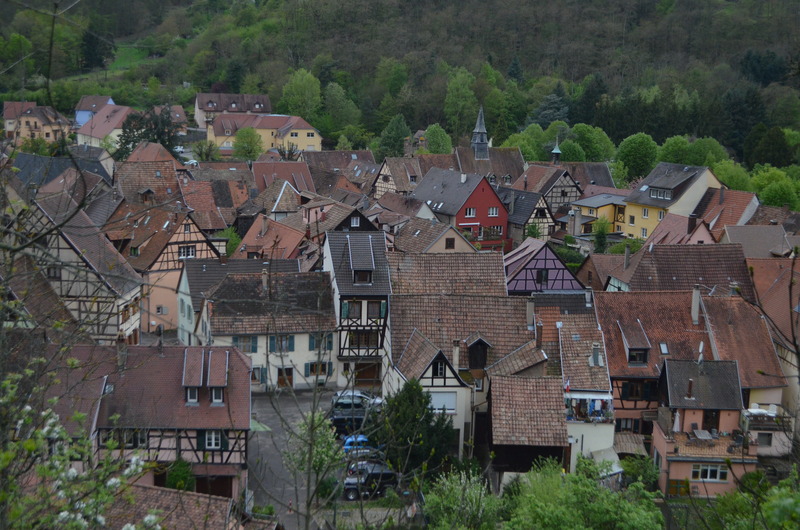 Beautiful timbered houses of different colors. 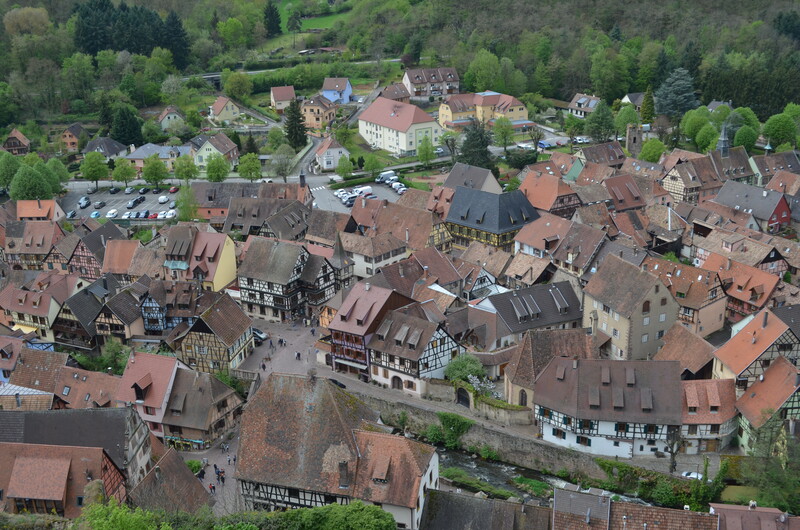 Even with my limited color vision compared to a human’s, I can still see how magnificent and diverse these houses are! Looks like one of those toy houses that children get for Christmas! 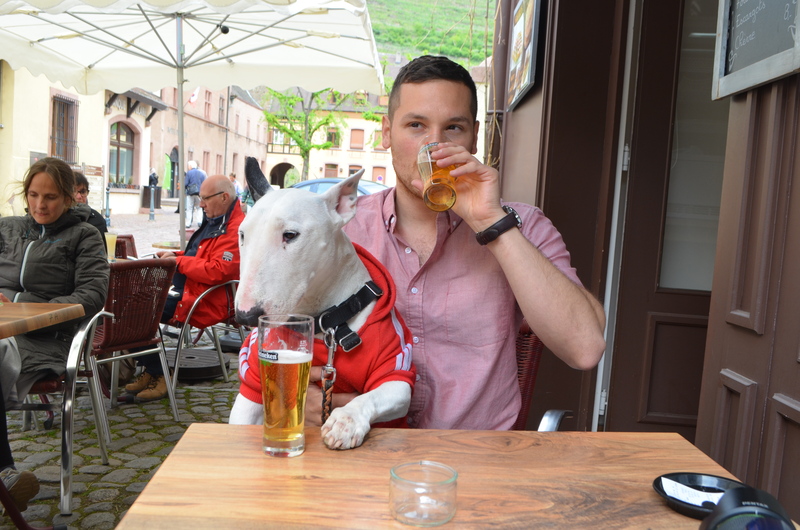 After trekking through the town for several hours it was time to find somewhere to have a snack and a drink! 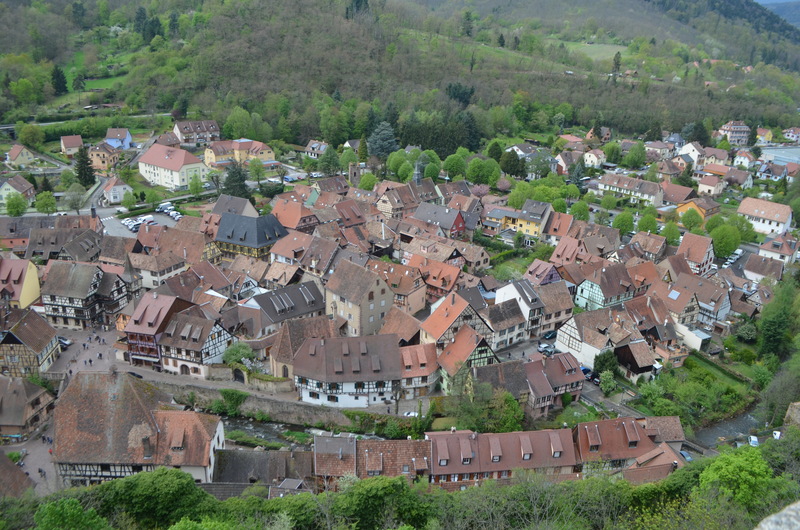 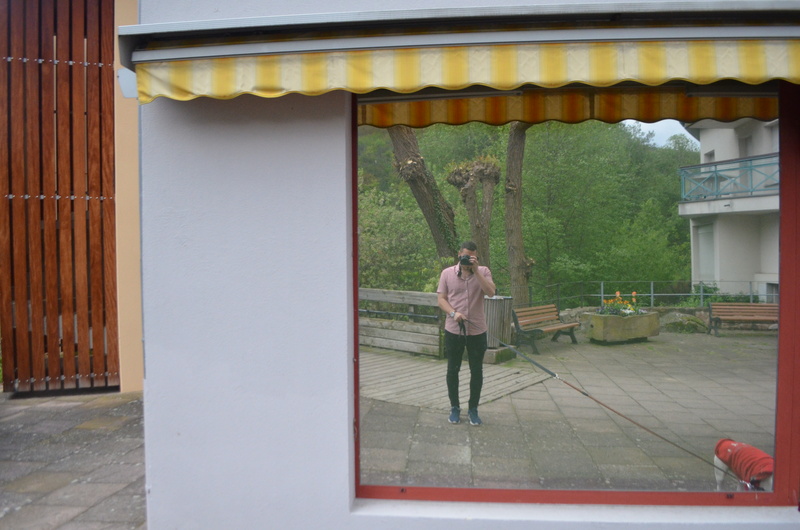 Luckily, there were no shortage of places to do that in Kaysersberg. 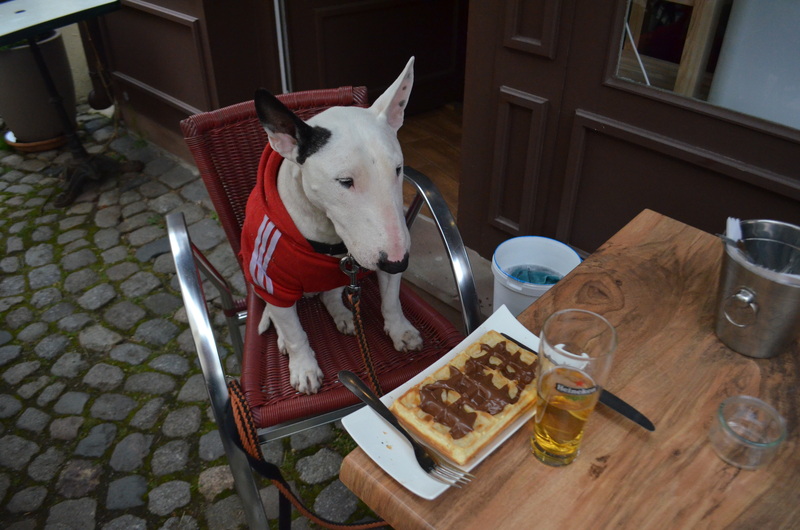 Waffles and Nutella? Count me in! 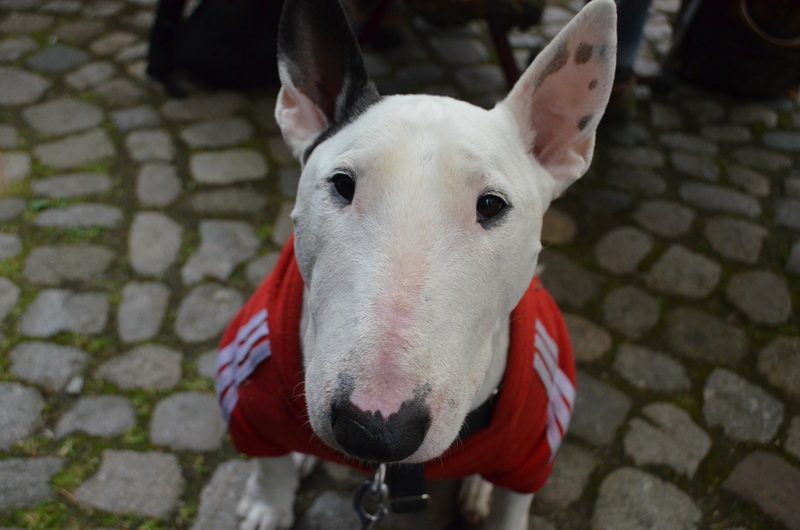 Can you say no to a face like this? 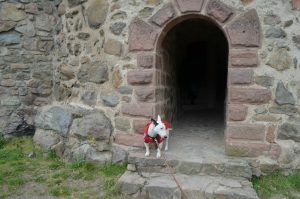 After fueling up on waffles and beer we headed upward to the mighty castle! 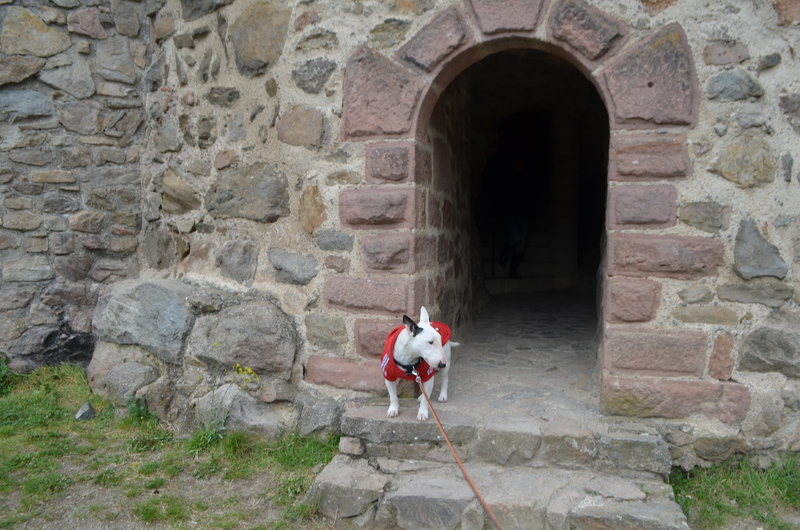 We climbed up the hill via a long flight of stairs and upon reaching the castle we entered and walked up yet another flight of tiny spiral stairs. 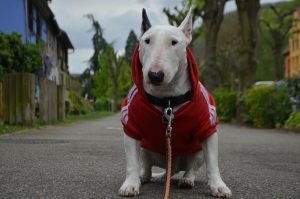 Needless to say, my paws were exhausted! 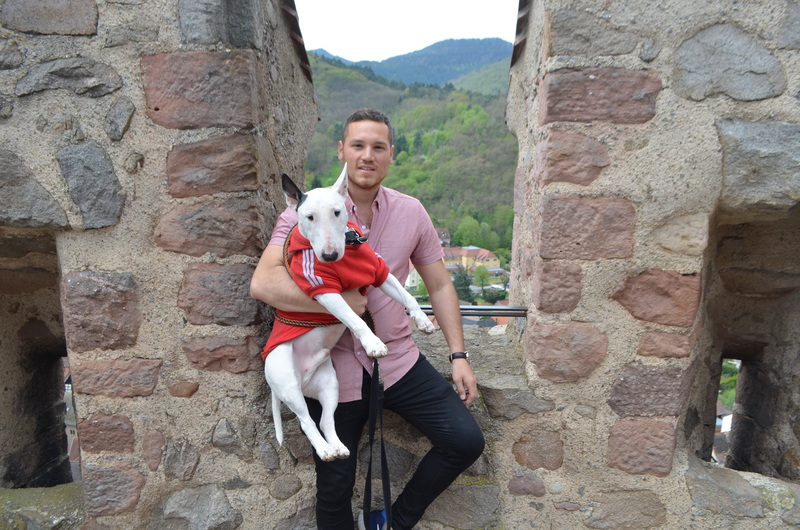 Me and Danny at the top! 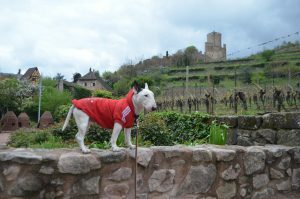 The top of the chateau, called the keep! The climb was hard but the view from the top was worth it! 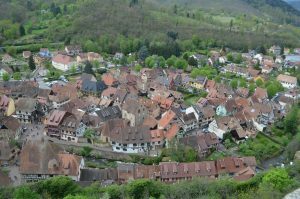 Look at all these houses! The exit of the castle led us to the east side of the village where there was more to explore! We circled around the town to get more views of the village and its different little gems. Take a look at all the colors! The blue here makes my tail wag non-stop! 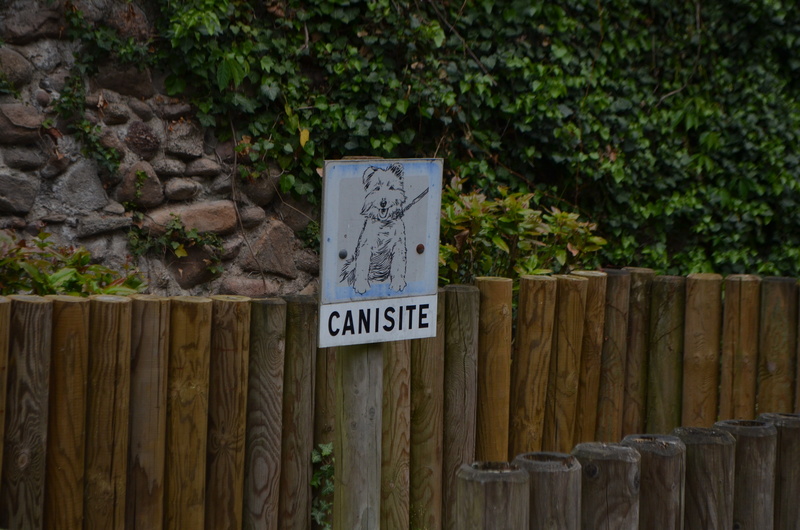 As you can see, plenty of dogs around! 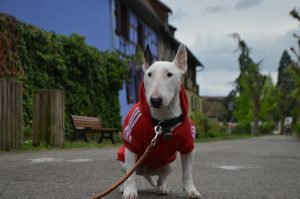 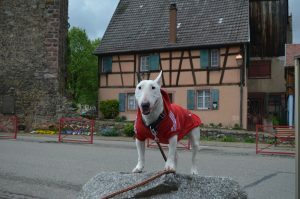 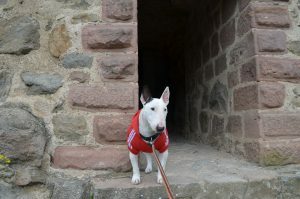 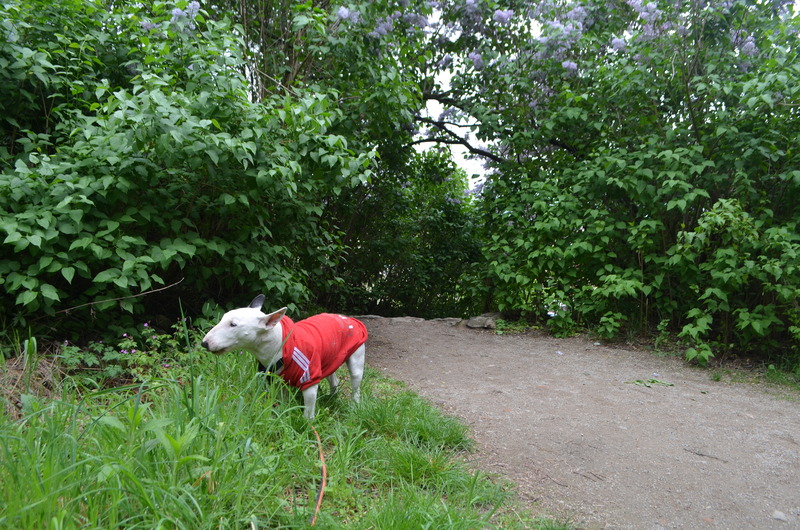 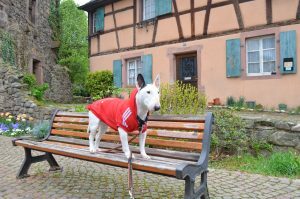 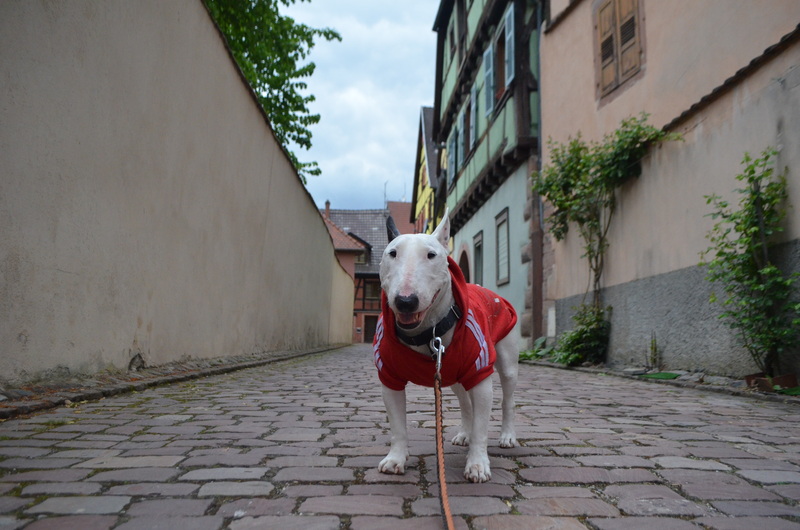 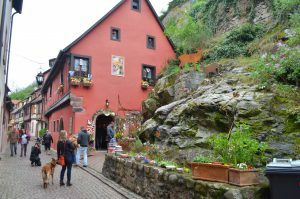 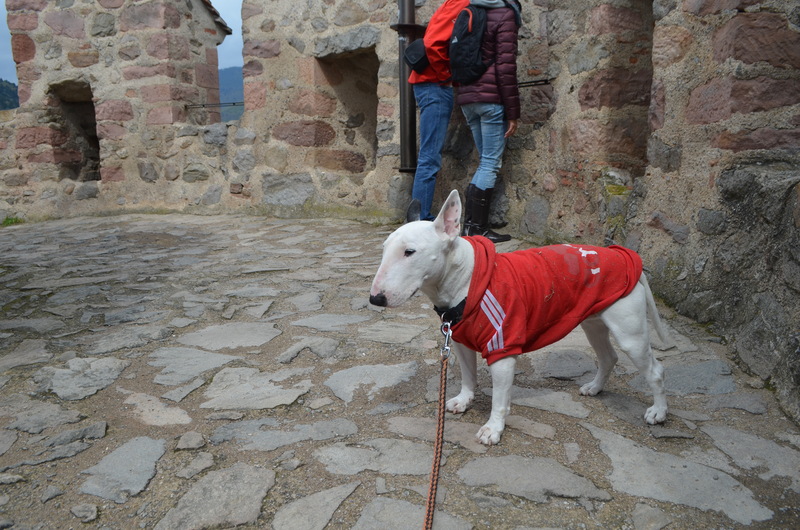 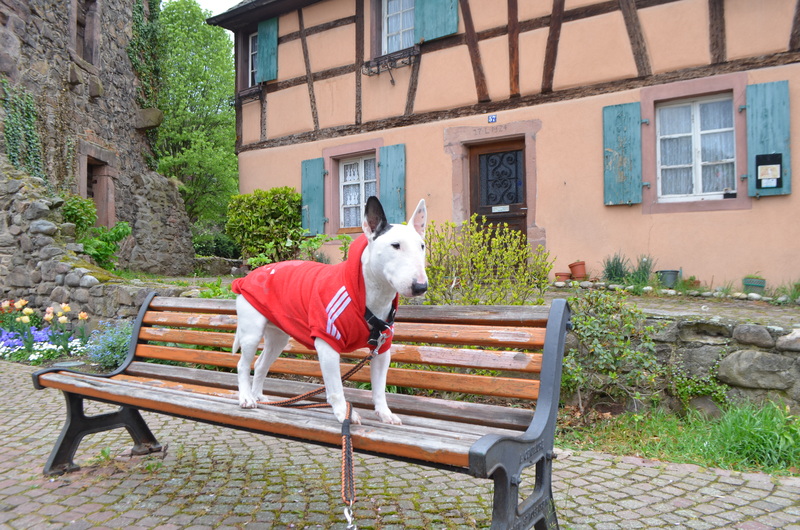 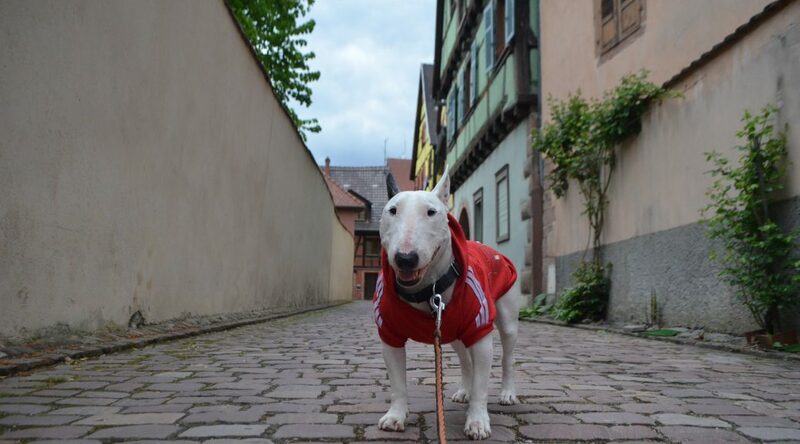 I was content that my paws were able to experience what it was like walking along the streets of Kaysersberg! 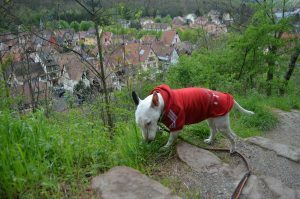 We came away from Kaysersberg feeling wonderful. 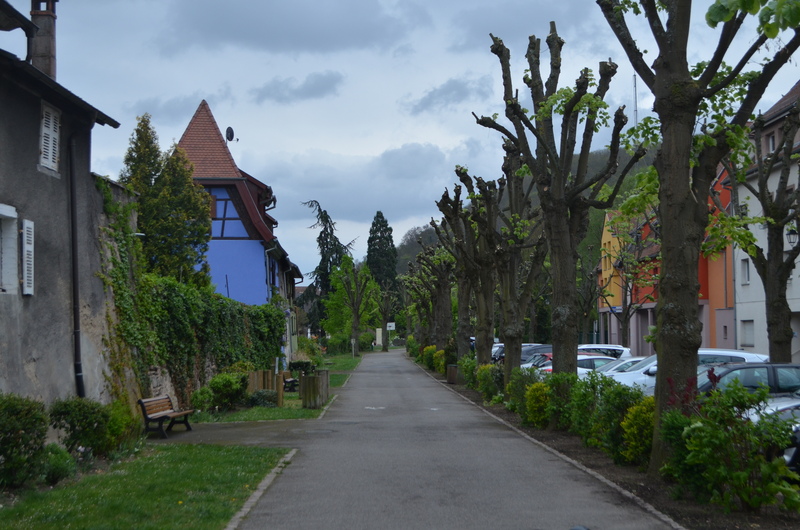 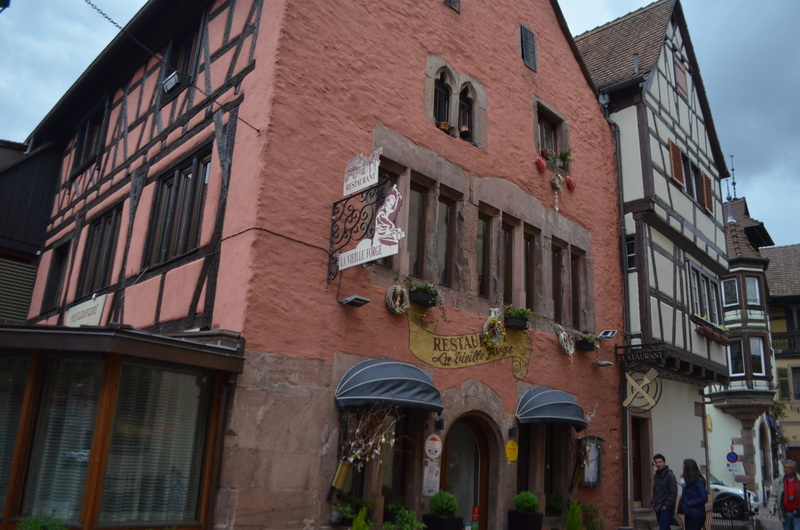 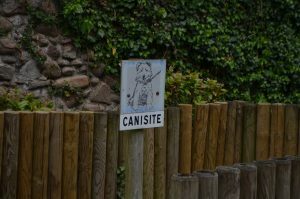 It was a small dip into the enchanted world of Alsace and we thoroughly enjoyed it. 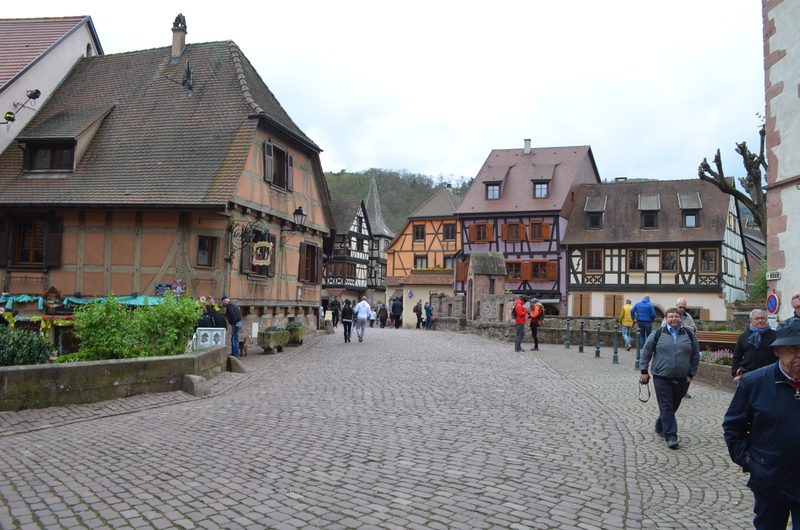 But for now, we hit the road in search of more castles! Stay tuned!